Ah, spring. The promise of sunshine, blooming trees, crunchy new vegetables and the meals that taste the way spring can make us feel: bright, fresh and full of life. While we can’t hasten the arrival of the most hopeful season, we can bring some of that energy into the kitchen with this meal, which makes use of late winter staples, but tastes sunny. Slow-cooked carnitas, scented with smoky cumin, cinnamon and orange, make an easy meal to share with friends. Tucked into tortillas with the colorful crunch of winter vegetables, zippy in a lime vinaigrette and a few drops of salsa—made with dried chilies instead of fresh—and you’ll swear you’re sitting in the sunshine. In a spice grinder, or using a mortar and pestle, grind oregano, cumin seeds, cinnamon, chili powder and salt into a fine powder. Place pork and onion in a large, heavy-bottomed pot or Dutch oven with a lid. Sprinkle the spice mixture over and turn and toss meat to coat evenly. Using a vegetable peeler, cut all zest from the orange in wide strips. Tuck strips of zest, bay leaves and smashed garlic cloves in between cubes of meat. Halve orange and squeeze juice over the mixture, taking care to retrieve any seeds that may fall in. Add apple cider and bring the mixture to a boil, skimming off any foam that may rise to the surface. Cover the pot and reduce the heat to very low, a bare simmer. Cook covered for two hours, until meltingly tender. Remove cover and continue to cook for another one to two hours until almost all liquid has evaporated and meat is beginning to sizzle and brown on the bottom. 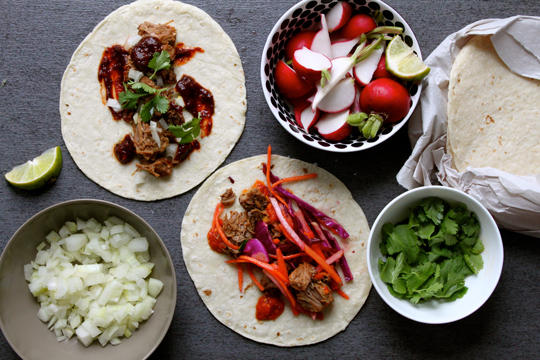 To serve, spoon into tortillas with your choice of Winter Slaw, onion, cilantro, salsa. Top with fresh radishes and squeeze with fresh lime juice. In large bowl combine lime juice, olive oil, cumin and salt. Whisk briefly to combine, and add onion. Toss to coat onion in vinaigrette and allow to marinate while prepping remaining vegetables. Either by hand or using a food processor fitted with a julienne blade, cut kohlrabi, carrots and beet into fine matchsticks. Mince cilantro stems and add them along with cabbage, kohlrabi, carrot and beet to bowl with onion. Toss to combine. Allow to sit at room temperature for at least 20 minutes, then top with cilantro leaves and serve. In a skillet over medium-high heat, toast chilies for a few seconds per side, just until fragrant. In a small saucepan, combine onion, chilies, and garlic and water to cover, about 1.5 cups. Bring to a boil. Remove from heat, cover and let steep 10 minutes. Dip out 1/2 cup of cooking water. Using tongs, fish onion out of saucepan and place into the jar of a blender or immersion blender. Do the same for cloves of garlic, pausing to peel them out of their papery skins. Retrieve chilies with tongs, pull off stems, and add chilies to blender. For a less spicy salsa, pour out some or all of the seeds after removing stems. Add half of the reserved cooking water and salt to blender and puree, thinning with more cooking water as needed. Add salt and squeeze in the juice of the lime and serve. Keep salsa in the refrigerator. Note: The heat of this salsa is entirely dependent on the kind of chilies you use. Chipotles yield a brick red, smoky salsa, while pasilla salsa is the color of fresh cherries and hot and fruity. Thai chilies yield a bright orange, seed-studded salsa that is fiercely spicy. Regardless of what kind you choose to use, this is more like a hot sauce than it is a salsa to serve with chips. If you prefer a milder salsa, or are serving this to heat-sensitive diners, add a can of diced tomatoes, drained of their liquid, to the blender when you puree the other ingredients, and adjust seasoning accordingly.